Figs, high in fiber and potassium, combined with sweet caramelized onion, salty prosciutto and creamy goat cheese turn pizza into a palate-pleasing masterpiece. In small nonstick skillet, heat 1 teaspoon olive oil and sauté onion, stirring occasionally, about 10 minutes until the onions start to turn golden. Add sugar and continue cooking until they are a caramel color. Set aside to cool. Preheat oven 450°F. On pizza crust, spread remaining 1 tablespoon olive oil and cover with orange marmalade. 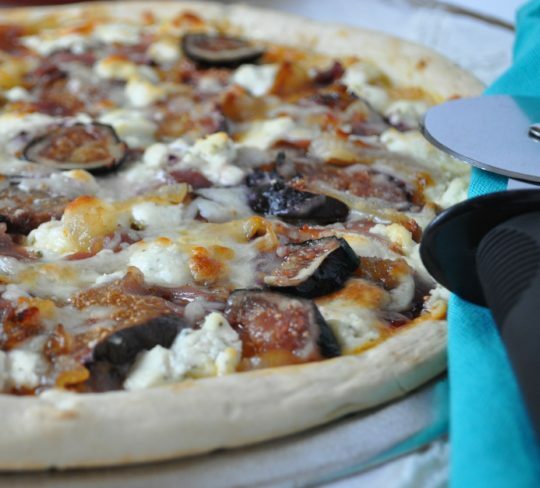 Arrange cooled onions, figs, prosciutto, goat cheese and mozzarella on crust. Sprinkle with rosemary, if desired. Bake 10-15 minutes or until cheese is melted and crust is crisp.